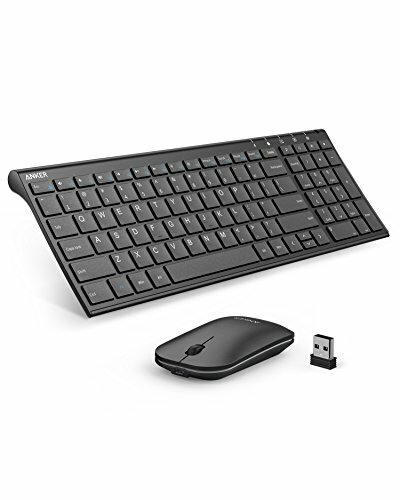 The Ultra-Portable Wireless Keyboard and Mouse for Windows OS. Powerful 2.4GHz wireless signal connects from up to 26 ft away, while unified nano receiver controls both keyboard and mouse from one USB port. Low profile keys deliver comfortable, near-silent typing that won't disrupt those around you. Measuring just 14.4 x 4.9 x 0.64 in and weighing 0.81 lbs, the keyboard and mouse are exceptionally portable. With no wires, your work-space remains uncluttered and neat. Get 2 hours of use every day for 3 months from a single charge. An auto-sleep function kicks in after 10 minutes of inactivity to save power. Tap a key to immediately wake up the devices. 1.Only compatible with products using Windows Operating System 2.If the keyboard is unresponsive, first move it closer to the unified nano receiver, then hold down the ESC key and press K or Q. 3. If the mouse is unresponsive, first move it closer to the unified nano receiver, then hold down the right and scroll buttons. Stable Connection: Stable 2.4GHz wireless signal boasts a range of 26 ft. Unified nano receiver controls both devices from one USB port. Enhanced Comfort: Low profile keys for smooth, whisper-quiet typing, and exceptional comfort. Portable Design: Compact, lightweight keyboard and ergonomically designed mouse take up minimal space. Efficient Power: Use for up to three months without charging (based on 2 hours' use per day). What You Get: Wireless keyboard, wireless mouse, unified nano receiver, silicone keyboard protector, USB cable (for charging), our 18-month warranty, and friendly customer service.